EN BLOC SALE: Leong showing a model of the Southgate project after the AGM. Mah Sing is targeting to conclude the sale of at least one block by the year end. Mah Sing Group Bhd is in talks with several foreign parties for an en bloc sale of two of its five blocks of buildings at its Southgate commercial development in Sungai Besi, Kuala Lumpur. The mid-to-high-end property developer is targeting to conclude the sale of at least one block by the year-end, group managing director Datuk Seri Leong Hoy Kum said. Each block could go for "over RM100 million", he said. "We are actually negotiating with these foreign purchasers. We have strong interest from the Middle East - such as the United Arab Emirates and Qatar - and also from a neighbouring country," Leong said, declining to elaborate. Southgate, Mah Sing's third commercial development in Kuala Lumpur, should be completed in 2011 and is expected to breathe new life into the surrounding areas such as Pudu and Loke Yew. The group, which also does residential developments, has a sales target of RM560 million for 2008 and plans to launch RM706 million worth of properties this year. Mah Sing plans to eventually raise its selling prices for new property launches that have yet to be built, given rising building material prices which have resulted in higher construction costs. "The sooner the buyer commits now, they may enjoy more attractive pricing. But eventually, we will have our prices increased in tandem with the construction cost increase," he said. He pointed out that construction costs, just prior to the fuel price increases in Malaysia, have gone up by between 20 per cent and 25 per cent. Mah Sing, which had a healthy cash balance of RM130.7 million as at end-March this year and a low gearing level, is also looking to expand its landbank. "We are planning to buy more land in the Klang Valley, Penang and Johor, but we are not in a hurry as the land must be able to fit well into our quick turnaround business model," Leong said. Leong is "selectively bullish" on the local property sector for this year and 2009, and sees growth for branded developers' medium-to-high-end residential and commercial projects in good locations. The group, which has yet to venture abroad, is also scouting for opportunities in regional markets such Vietnam, China and India. In Vietnam, for instance, it would be interested in doing a mixed development project with a local partner, he said. KUALA LUMPUR: Mah Sing Group Bhd targets RM560mil sales out of RM706mil worth of properties to be launched this year, as it is “selectively bullish” about the property sector in 2008 and 2009, managing director Datuk Seri Leong Hoy Kum said. Despite rising inflation and fuel prices, its sales and launch targets were on track, with the group raking RM116mil in sales and RM201mil in launches for the first quarter, he said. “The group’s focus on customer-centric homes and value investments has resulted in strong sales for both the group’s residential and commercial projects,” he said after the company AGM yesterday. Leong said the group had been closely monitoring the increase in building material prices over the past year and had been building ahead of schedule to lock in construction costs. On rising fuel prices and inflation, he said good property companies with innovative products and the flexibility to adjust to current market needs should emerge stronger. “Things may not be all that bad for the property sector. Not only are the banks in good shape, households are not over-extended. The ratio of household debt to gross domestic product in our country is very low compared with countries like Britain and the US,” he said, adding that the group would be able to maintain its performance. Mah Sing reported a 24% year-on-year increase in net profit to RM81.13mil. For the first quarter ended March 31 its net profit jumped 25% to RM22.31mil. It has 584 acres of land bank left with a total gross development value (GDV) of RM3bil and unbilled sales of RM1bil as at March 31. On its Southgate Commercial Centre, Leong said it had seen a strong take-up of RM40mil during its private preview for the Vivo block. The recent launch of the Vox block also saw about RM78mil sales or 70% of available retail units and office suites sold. It is talking with some foreign parties to sell en bloc two of the five blocks. “We’ve nine months to build the car park. This would be a window period for the rising cost of construction materials to cool off,” he said. He however noted that if costs kept rising, future launches would inevitably be more expensive. Mah Sing’s residential properties also saw strong sales. For example, the first phase of Hijauan Residence in Cheras is 99% sold while launched units in Kemuning Residence in Shah Alam is 75% sold. Launched units in Sierra Perdana in Johor Baru also saw take up of 71% in sales value. Developers may be passing on price ncreases to customers. PETALING JAYA: More contractors are asking for a revision in their contract prices following the spike in prices of building essentials. LBS Bina Group Bhd group managing director Datuk Lim Hock San said the company had been approached by “one or two” of its contractors for a change in the price of its contracts. “We had to revise upwards the price or they would have run away,” he said, adding that the firm had already started to slow down in its property launches given the current challenging environment. “We have been closely monitoring the increase in building material prices over the past year, and have been building ahead of schedule to lock in the construction costs as we foresaw escalating raw material costs. “Hence, construction of selected projects is at the tail end, and both Mah Sing and our contractors have locked in the old costs,” Leong said. Chow said that while these “re-negotiation” processes had started two to three months ago, it was more pronounced now, given the added pressure of the recent hike in fuel price. The price of steel, one of the main raw materials for property players for example, has almost doubled year-on-year to around RM3,600 per tonne currently. Strong demand from China and the Gulf Cooperation Council region has helped push up prices thus far. Contractors’ overall costs are said to have gone up as much as 28% to date. TA Securities property sector analyst Kamarul Zaman Hassan said it was inevitable that re-negotiations of contract prices would occur, given the rise in raw materials, such as steel and cement. “Yes, the contractors would definitely ask to re-negotiate. They are likely to ask for variation orders (VOs) to cover the rise in raw material prices,” he said. Should contractors be unable to obtain VOs, the possibility of projects being abandoned will be high, in particular if smaller contractors – who do not have the financial strength to absorb higher raw material prices – are involved. “And yes, obviously developers involved in new projects cannot stomach the rise in building materials and will be passing it on to customers,” Kamarul said. Analysts had warned that certain property segments, i.e. those priced below RM250,000, were very price sensitive, meaning higher prices would see an erosion in demand. “This puts developers in a very delicate situation. As we can see, many developers are already thinking about postponing their launches,” Kamarul added. Having said that, higher-end office and commercial developers are still expected to enjoy brisk sales despite higher selling prices. “The impact really depends on the company’s products,” he said. Meanwhile, Ng Sem Guan who covers the steel sector at OSK Research feels that it is not a necessity to stockpile steel. Ng said at current prices, there was still some upside, probably up to 20%. “But it (steel price) goes through a cycle, it will reach a point when it has to come down,” he added. Last week, Master Builders Association Malaysia president Patrick Wong urged the Government to stockpile steel to stabilise the rising cost of steel products. He said the proposal came in the wake of steel millers expecting prices of steel bars to hit RM5,000 per tonne. PROPERTY developer Asas Dunia Bhd said it will concentrate on selling off what's already been built this year and hold off new launches. The Penang-based developer has three new residential projects pending approval in Nibong Tebal, Jawi and Permatang Tinggi in Seberang Prai, with a total gross development value of RM215 million. "Once approval is granted for the projects, we will begin earthworks at the 40ha site. However, timing of the launches will hinge on construction costs versus our selling prices," Asas Dunia managing director Datuk Jerry Chan said after the company's annual shareholders' meeting in Penang yesterday. Chan: Penang's construction sector is going through a period of "hyper-inflation"
Chan said the construction sector in Penang is currently going through a period of "hyper-inflation" with rising cement and steel prices. As such, any new launches by the company this year will depend on the backlog of unsold properties and its gearing level. Asas Dunia's borrowings stand at be-low RM50 million. Chan said its current unsold residential units were worth RM95 million, industrial RM13.5 million and commercial RM10 million. "Our priority for now is to dispose of the unsold units, which will be priced between 25 per cent and 30 per cent higher than what we were selling before." The unsold residential units are priced bet-ween RM110,000 and RM300,000, industrial ones RM350,00 and RM500,000, and commercial units RM180,000 and RM300,000. All of Asas Dunia's projects are located on mainland Penang. It has 560ha of landbank held for development. "The development value of the buildings, when erected on our landbank, will be in the region of RM2.8 billion," Chan said. He said the federal government's plan to construct the second penang bridge has also generally enhanced the value of the group's properties and developments. "It is a major relief for us to hear that the government will go ahead with the project as that will increase our properties' accessibility," he added. GEORGE TOWN: Asas Dunia Bhd is raising prices of its new landed properties on the mainland by 25% to 30% next year due to soaring energy and raw material prices. Group managing director Datuk Jerry Chan said the group planned to launch 1,176 single- and double-storey terraced and semi-detached properties in Bukit Mertajam, Jawi and Nibong Tebal. The gross development value of the new properties is about RM215mil. “We are likely to start construction work in two months. We will launch the properties only when we have completed about 50% of the units next year,” he said after the company AGM yesterday. To reduce construction costs, the group would build units with smaller built-up areas, Chan said. “We would also build more single-storey units, which will comprise about 30% of the new launch,” he said. For existing unsold properties, the group would increase selling prices by about 10%, he said. Landed properties on the mainland are currently priced between RM110,000 and RM300,000 per unit, depending on the built-up area, type and location. Chan said soaring raw material prices would result in lower supply of properties. “Developers will be more cautious in launching new projects. The population will continue to grow while there will be limited supply of properties. “In this scenario, property prices are likely to escalate further,” he added. SINGAPORE'S central bank is seeking to develop a market in Islamic real estate investment trusts to attract funds from the wealthy in Asia and the Middle East. "There is budding market interest to explore Syariah-compliant REIT listings and property players are looking to the Singapore REIT market," Tai Boon Leong, executive director at the Monetary Authority of Singapore, said in an e-mailed statement. Rising wealth and economic growth in Asia will boost demand for Islamic investments, he said. The Southeast Asian city-state, competing with neighbours Malaysia and Indonesia, is encouraging financial institutions to introduce more products that comply with Islamic law, or Syariah. The Islamic financial market may triple in size to US$2.8 trillion by 2015, according to an estimate from the Kuala Lumpur-based Islamic Financial Services Board. Singapore had 19 publicly traded real estate investment trusts, or REITs, and one property trust with combined market capitalisation of S$27 billion (US$19.8 billion) in 2007, the largest in Asia outside Japan, according to the central bank. Malaysia's KPJ Healthcare Bhd in August 2006 offered the world's first publicly traded Islamic REIT. "The growing pool of liquidity in the Middle East portends well for Asia as much of it is reportedly looking for suitable investments in Asia," Tai said in prepared remarks at an Islamic finance meeting in Malaysia. In May, Singapore's central bank said it plans to start a so-called facility that will allow it to start a bond market complying with Islamic principles. The Islamic bonds, or sukuk, will be offered in Singapore dollars and priced against conventional government securities. With an Islamic REIT, payments to investors are based on rental income or dividends, while offering the potential for capital appreciation. Syariah, or Islamic law, bans the exchange of interest and investment in businesses such as tobacco, alcohol and gaming. SINGAPORE: AMP Capital Investors said yesterday it was aiming to boost its long-term investment in Asia properties to A$16bil (US$15.3bil) and will kick off the plan by doubling its industrial property assets in Singapore. The investment unit of Australia's top pension fund manager AMP Ltd is also looking to buy properties or acquire businesses such as real estate investment trusts and developers, in Japan and China. “Generally markets are coming off, and we see that as a buying opportunity over the next 18 months,” said AMP Capital's chief investment officer Andrew Bird at the Reuters Global Real Estate Summit in Singapore. “We see an opportunity to grow our business in this kind of environment, to buy under-priced assets or under-priced businesses,” said Bird, whose firm now has about US$100bil in funds under management, including US$15.3bil invested in Australian property. He said Singapore's industrial property sector had yet to reach its peak. AMP Capital has acquired some S$300mil (US$220mil) worth of industrial properties in the city state since opening its first Asian office in Singapore February last year. The firm also set up a new Tokyo office in December. Those Singapore assets are its sole property investments in Asia so far. Bird said Singapore and Japan were the firm's top choices for acquisitions as it has staff on the ground conducting research, and plans to do the same for China soon. “The next place we want to have people on the ground will be in China, as long term that is a very attractive market to us,” Bird said. “We don't believe in flying into a place with our cheque books and fly out again with assets. That tends to be a good way to lose money,” he said. Bird said the firm had scrapped plans to list the Singapore properties through a real estate investment trust (REIT) due to poor financial market conditions and volatility, and now preferred to focus on unlisted wholesale funds. AMP Capital, whose Global Direct Property Fund has raised A$200mil from pension fund managers since it was launched in 2006, also acquired three properties from the United States and Italy last year, worth a total of A$122mil. “The reason we haven't invested any money from that fund in Asia is because Asian markets have been very strong, while the US market was probably the first to decline,” he said. With the Australian stock market facing a downturn, Bird expects to see further consolidation among Aussie firms and said AMP Capital was looking at buying opportunities in the market. SINGAPORE: Dubai's ETA Star Property Developers plans to raise US$400mil through a fund and Islamic bonds for a drive into Asian markets as diverse as India and Laos, but rising costs are deterring the firm in Turkey and Egypt. The company, part of privately held ETAAscon Group, is looking to supplement its own funds to develop 120 million sq ft in India, and enter other markets in Asia. It has also just snapped up land in Vietnam and Malaysia. The new fund will be aimed at Middle East investors, said ETA Star Property's executive director Abid Junaid. “We're talking to institutional investors to raise US$250mil in a first tranche,” Junaid told the Reuters Global Real Estate Summit in Singapore. ETA Star is one of several Middle East firms, including EMAAR Properties and Nakheel, that have joined a wave of foreign investment in Indian property since the country eased rules on inward investment in the construction industry in 2005. Junaid, who is from the southern Indian city of Chennai, said the firm had bought about a fifth of its land in India before the boom of the last three years, which has seen values in many areas quadruple. ETA Star is building housing, information technology parks and shopping centres in Chennai and Bangalore. Although internal rates of return for property investment in India are still above 20%, Junaid was worried that soaring construction costs were making property more expensive, and slowing sales of housing. KUALA LUMPUR: The Malaysian Institute of Estate Agents (MIEA) wants the board of valuers, appraisers and estate agents to have more estate agents to “truly” reflect this group's contribution. MIEA president K. Soma Sundram said it was disheartening that MIEA had only two members on the board. “We will be writing to the board on this issue soon. We in MIEA do not want to see that policy repeated in the registration of negotiators. “This subject is close to our heart and almost every estate agent I have met feels that the negotiators are the pride of estate agents and should be their custodians,” he said at the MIEA annual dinner here recently. He said MIEA had made significant contributions to the property sector. “Gone are the days when we were not even considered players in the industry. He added that MIEA was prepared to submit suggestions to the Customs Department on service tax collection. On the registration of negotiators, he said the exercise should be done by MIEA, adding that this was gaining momentum and attracting interest at all levels. “Some see it as a great opportunity to make money through the registration; some are fearful that this exercise will create an imbalance in the control of the fraternity, while some pessimists believe it is a waste of time,” he said. He said MIEA should not be sidelined in this issue because only MIEA represented the estate agency profession and practice. Moreover, it had implemented this programme for the last 10 years with over 2,000 negotiators. “It is our view that we don’t need to reinvent this particular wheel. I must agree that there is room to improve this registration,” he added. On commissions payable to negotiators, he said half the agents wanted a 70% ceiling while the other half wanted an open plan. At the dinner, he officially launched the MIEA ‘UNITY 500’ campaign to attract 500 members. SELANGOR aims to take the lead in the “build-and-then-sell” concept for housing projects to reduce the incidence of house buyers being cheated by unscrupulous developers. “I'm trying to work with the PKNS (Selangor Development Corporation) on one or two projects first. We will also raise this issue with the Housing and Local Government Ministry and Parliament,” said Selangor Mentri Besar Tan Sri Abdul Khalid Ibrahim when speaking at the opening of Taman Medan assemblyman Haniza Talha's service centre in Taman Medan Pejasa, Petaling Jaya. Khalid: In most developed countries, there is no such thing as paying for the house before it is built. “In most developed countries, there is no such thing as paying for the house before it is built. For example, in Australia, you have the right to sell only when the project is completed. 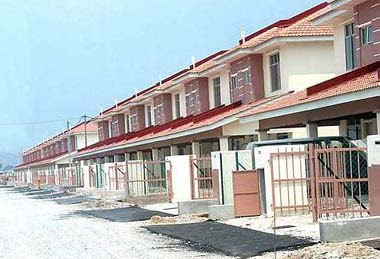 It was reported earlier that there were 141 abandoned projects in the state, 108 of them housing projects. Khalid said such projects had been abandoned since six years ago and exceeded more than RM1 billion in value. “We don’t want this to be done immediately, but it has to be done in stages so that in future, there will be a lot more people who will build first before selling. He said the state government would consider giving incentives to developers who wanted to implement the concept, but cautioned that pricing was an important issue that needed to be thrashed out with the Housing and Local Government Ministry. On resolving the problem of the present abandoned projects, Khalid said that they would search for the runaway developers and talk to the distressed house or flat buyers as well as bank representatives, so that they could work towards completing the projects. He also addressed the issue of companies which abandoned previous projects and come up with new ones under a new company. “The state government won't blacklist the company, but we will blacklist the directors and owners of the companies,” said Khalid. DOHA: Local construction firms Gamuda Bhd and WCT Engineering Bhd, which have a strong partnership in the Middle East, are confident that they will be able to jointly secure a new highway project worth at least RM1bil in Qatar this year. Company officials based in the Gulf state said the tender for phase two of the Dukhan highway was expected to open as early as next month, as the first phase of the project nears completion. “We believe we are in a good position to get the contract as this is actually an extension to the current highway project that we are doing, which is almost 90% completed,'' general manager for the Dukhan highway project S.D. Boon told visiting Malaysian reporters in Doha last week. He said the Gamuda-WCT joint venture (JV) was already pre-qualified for the tender, and was likely to be called in to submit its bid soon. The JV is the contractor for the 43km four-lane dual carriageway linking the industrial area in Dukhan to Shahaniya. The contract was awarded in July 2005 for 750 million Qatar riyals or RM784mil at the time. Boon said the second phase of the highway would probably cost more to construct, partly due to higher material cost. Gamuda has a 51% stake in the JV, while WCT owns 49%. Shahaniya is located midway between Dukhan on the west coast and the capital city Doha on the east coast of the peninsula. Qatar's public works authority is planning to upgrade the road link between the country's thriving financial centre in Doha and the fast growing oil and gas industrial area in Dukhan. Apart from the Dukhan highway, Gamuda and WCT are partners in a consortium led by China’s Sinohydro Corp Ltd for engineering works being done at the New Doha International Airport (NDIA). The completion date for the NDIA contract has been pushed back to 2010 to make way for additional works that had bumped up the original contract value awarded to the consortium from RM1.8bil to RM2.8bil currently. Individually, the two companies are also involved in several infrastructure development projects in the region. Both had excellent track records there, analysts said. A new job secured in the Middle East – where margins are typically higher compared with local projects – would help shore up sentiment on Gamuda and WCT. Shares in Gamuda fell 6 sen yesterday to RM2.13 – its lowest level since November 2006. Meanwhile, WCT's share price hit a one-year low of RM2.89 last Friday. The stock was down 2 sen at RM2.95 yesterday. CAPITALAND Ltd, Southeast Asia's biggest developer by sales, and China's biggest state-owned investment firm Citic Group, formed a 500 million yuan (US$73 million) fund to invest in the country's business parks. CapitaLand will hold a 50 per cent stake in the real estate private equity fund, while Chinese investors will own the rest of the developer's first yuan-based fund, the companies said in a statement to the Singapore exchange. The Citic CapitaLand Business Park Fund is Singapore-based CapitaLand's seventh private-equity fund in China. SCOMI Engineering Bhd, a unit of Scomi Group Bhd, is upbeat about securing a monorail contract in Mumbai, India, but hopes to secure the monorail project in Penang first. Its president, Hilmy Zaini, said the company wants to introduce its second generation monorail called Sutra, which was launched in November last year in Penang, before launching the new innovative system to other parts of the world. "It would be good for us to launch the new Sutra at the company's hometown in Penang," he told reporters after Scomi Engineering's annual general meeting in Kuala Lumpur yesterday. Hilmy was asked to update the progress of the monorail project in Penang, which is currently facing uncertainty. "There is nothing much to update. We are waiting for the results (whether to go on with the project or not). We don't know when (a decision will be made). "The Mumbai monorail project is closing the tender in a few weeks time. But we hope to get the Penang monorail first," he said. Scomi is part of a group that includes Malaysian Resources Corp Bhd (MRCB), which is bidding for the monorail project on Penang island. In January this year, Syarikat Prasarana Negara Bhd awarded a letter of intent for the project to MRCB, which formed a consortium with Penang Port Sdn Bhd and Scomi Engineering Bhd. However, the project has been put in doubt after the Pakatan Rakyat win in Penang during the last general elections on March 8. Apart from Mumbai and Penang, Hilmy said, the company is also looking to bid for monorail projects in the Middle East, Vietnam, Africa and several cities in India. He said the company has been engaged to conduct feasibility studies in Vietnam and Saudi Arabia. "We hope to complete the study in Vietnam in three months times, while in Saudi Arabia it will take between six months and a year to complete. "When completed, we will present our findings to the respective authorities and submit our bids for the projects," he said. Hilmy said the company aims to set up two new machine shops in a year, starting from 2009.